Herman Breedt, President of the Johannesburg Chamber of Commerce and Industry I wish to take this opportunity to thank my fellow Board members for their time, hard work and constructive input. My thanks also go to the past president, life members, chairpersons and members of the Regional Committees, Clusters and Commissions, who through their efforts extend the ambit of what the Chamber can achieve. JCCJ is a member-driven organisation and it strives to ensure that the value it provides is evident to the businesses that become members. What we offer revolves around the promotion of international trade, business facilitation, support, training, networking and advocacy. My tenure as President comes at a time when South Africa is beset by serious economic problems and an anaemic growth rate. Compounding the problem is the steep increase in utilities, which is adversely affecting our international competitiveness. I have focused, therefore, on encouraging members to sustain and grow their businesses by adopting a global approach and diversifying their markets by engaging both nationally and internationally. The Chamber can be of great assistance in this area as it has extensive experience, expertise and a network of international contacts. I have applied myself particularly to establishing and strengthening bi-lateral relationships with foreign governments to broaden the scope of the markets available to JCCI members. I represented JCCI on visits to Djibouti, Taiwan, Russia and Dubai and hosted several events for incoming delegations. An MOU was signed with the Chamber of Commerce and Industry of Blida Mitidja in Algiers. The Chamber SME Export Incubator is an important vehicle through which developing SMEs are upskilled and mentored to become sustainable exporters who contribute to job creation and growing the economy. In this project we have been fortunate to have the financial support of patron member, Standard Bank, which provided the funds to set up the infrastructure and the German government, through the agency of GIZ. On the domestic front, JCCI is a valuable source of government contacts, connectivity to local and international businesses and a key resource for specialist expertise, training and up-todate information on legislative requirements. The Chamber lobby is a mechanism through which business can contribute to government policy making. JCCI applies a great deal of effort to promote stakeholder partnerships. Events organised by the Chamber provide a platform for interaction between government at all three levels and the private sector. The Annual Chamber Conference, launched in 2016 under the banner of Inclusive Growth through Stakeholder Partnerships by past president, Ernest Mahlaule, has been a prime vehicle to promote stakeholder collaboration. The 2017 Conference showcased Supplier Development initiatives. The case studies presented were so informative and interesting that the Gauteng Premier spent the entire day at the conference. Membership remains the single biggest challenge for JCCI - the main reasons being the poor state of the economy, the loss of business confidence and the proliferation of competitor organisations. As most companies join the Chamber as the result of a referral from another member, I urge you all to play your part in encouraging businesses to become members. It is a Chamber motto that today's contact is tomorrow's contract. 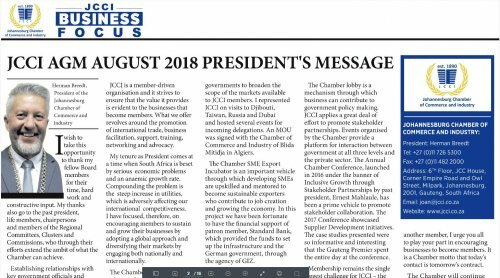 The Chamber will continue to play a constructive role in collaboration with the other stakeholders in the economic community to contribute positively to a prosperous future.